How To Grow Kale | Grow This! 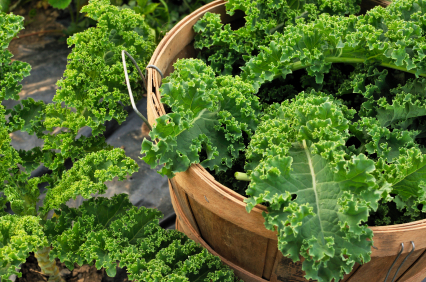 Kale is a great vegetable to grow at home and can even be grown in a container. Many will refer to kale as a cold weather crop but it can thrive in just about any climate. Kale leaves begin to taste bitter once growing temperatures exceed 80° F, but bitter kale is just as nutritious and can contribute nice to many different culinary dishes. Here are some simple instructions on how to grow kale. Be sure soil temperatures are at least 40° F before planting. Kale is a cold weather crop and can survive in temperatures as low as 20° F. In fact, it can improve the flavor if the plant is touched by bit of frost. However, it is always a good idea to cover young plants to protect them from extremely cold winds. Kale does well when soil temperatures are around 70° F.
For best results, sow your seeds 2 to 4 weeks prior to the last frost of winter. You may also start them indoors 5 to 7 weeks before the last frost. Transplant 3 to 4 inch seedlings, with at least 4 leaves, outdoors 1 week before the last frost. For a fall crop, plant at least 10 weeks before the first frost of the season. Kale likes full sun exposure when grown in cool climates. If you are growing in a hotter area, plant in partial shade. Kale does well near herbs, beets, potatoes and onions but try to keep it away from tomatoes, strawberries and beans. Kale thrives in well-drained, loose soil with good fertility. Unlike many other leafy greens, kale does not need a lot of nitrogen to do well. Avoid light, sandy soil as well as heavy clay soil. Fortify your soil with organic compost just before planting. Sow kale seeds ½ inch deep and about 3 inches apart. Once they are about 4 inches tall, thin them to 12 inches apart. Transplant seedlings 12 to 15 inches apart. Water regularly, keeping the soil moist but avoid letting it get muddy. Moist soil will help ensure sweet, crisp leaves. Most kale varieties are ready for harvest about 70 to 95 days after seeds have been sown. Start by cutting the outside leaves once the plant is 8 to 10 inches tall. You can also harvest the entire plant by cutting the stock 2 inches above the soil. The plant will begin to grow new leaves within 2 weeks. Remove any browning or tough leaves. Fertilize every 6 weeks or so with a good compost tea. Try compost mulch to help fertilize and retain moisture in the soil. Kale is sweetest if grown in fall and harvested just after being touched by frost.